Field of view approximately 98º x 75º. Exposed at f/4.5, ISO 640. Total duration of trails: 50.5 minutes, consisting of 98 x 25 second exposures taken 5 seconds apart. 3 polluted images discarded – hence some gaps in the trails. Tamron 10mm lens on Canon 60D camera. 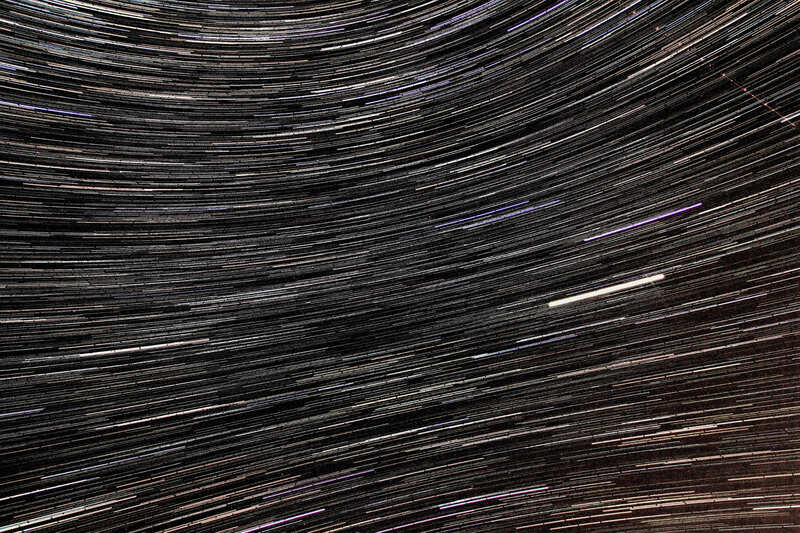 Whilst a wide-field lens will naturally distort any image, the curved sidereal trails clearly indicate the celestial equator (where the trail appears as a straight line between the curves) and the meridian line (a line between the two poles which passes through the zenith and bisects the equator where the curves appear to touch). Further information over on Above Us Only Sky.